Editorial: While a smoke and mirror effort this year produced a budget OK Courts will likely soon blow up; don’t worry – conservative legislative leadership did accomplish something meaningful. You may be stopped, lectured, inspected, judged, possibly impoverished and now ticketed $235.25 and court costs for driving in the left lane. Have a nice pay. By what standard will taxpayers be ticketed? In the judgment of the officer, of course, just like they can take any cash you may be holding if they don’t like how you are dressed or how you talk or if they don’t like what you say. Of course, all should bow to subjective opinion from any functionary with a badge and a gun. 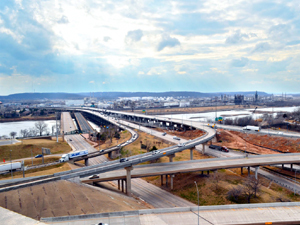 Dale Derwalt writing for the Oklahoman today reports: “The new law adopted this year by the Oklahoma Legislature prohibits being in the left-most lane of a roadway that has four or more lanes, like a highway with two lanes of travel each going in opposite directions. The message from the Department of Public Safety is that the left lane should be clear aside from some exceptions. 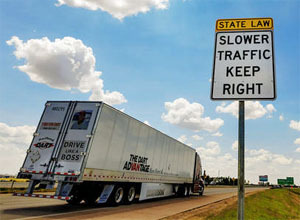 Come November, however, the law says drivers can only be there if traffic conditions and flow prevent you from merging right, if the road is configured in a way that keeps drivers in the left lane or if other vehicles will be merging onto the roadway. Regardless, everyone should be exceptionally polite and forthright to law enforcement. They put their lives on the line every day to make sure our communities and our state are safe and we owe them respect and full cooperation for dealing with the ever-present risk of injury or death on the job – they sacrifice for our safety and stress is significant. 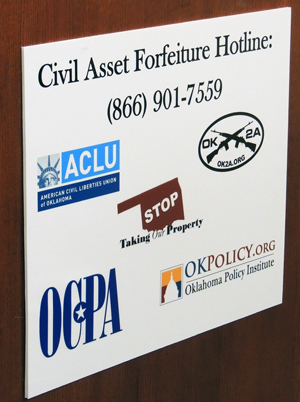 Respect would be more organic in Oklahoma if Civil Asset Forfeiture reform had happened. Sadly, our advocate for reform, former-Senator Kyle Loveless (R-OKC), committed ethics violations in handling campaign funds and resigned. Maybe another elected official will have the courage to stand against a cascade of abuse from District Attorneys and Enforcement which fund their good office(s) from forfeiture revenue. Maybe media will, one day, become advocates for citizens rather than tools for armed badged agents from which they get “inside” stories and great quotes. Lavrentiy Beria, head of Joseph Stalin’s secret police once said, “Show me the man, and I’ll show you the crime.” That abuse of law is why communism is judged evil. In Western Civilization the Rule of Law applies equally – to Hillary Clinton, Barack Obama, Donald J. Trump and Joe Six-pack. Back to those hideous left lane law breakers: does it only matter in rural areas? More reports and video is available here on the Oklahoman. This entry was posted in State on July 24, 2017 by admin.